A new space race is beginning, but this time between privatecompanies, not nations. Businesses in the United States and Russia are vying tobe the first to launch a private space station. One project, an inflatable space habitat, already has sixclients waiting for it, according to the company, Bigelow Aerospace of LasVegas. "We're just beginning to see the tip of the icebergwith commercial opportunities and pent-up demand," Mike Gold, BigelowAerospace's director of Washington, D.C. operations and business growth, toldSPACE.com. The Russian project has received support from the official Russianspace program. "We consider the Commercial Space Station a veryinteresting project, encouraging private participation," said VitalyDavydov, deputy head of Russia's Federal Space Agency. "It will attractprivate investment for the Russian space industry." To date, space stations have been a national orinternational affair. Russia achieved early success with its Salyut and Mirstations, and NASA brought the United States into the game first with Skylab in1973. The U.S. and Russia have since teamed up with 13 other countries to buildthe $100 billion International Space Station, which celebrated a decade ofcontinuous manned operations this month. But private space stations like those promised by BigelowAerospace and the Moscow-based Orbital Technologies, which is backing theCommercial Space Station, hold the promise of catering to a wider clientele ? acustomer base? that includes scientists and governments, as well as materialsmanufactures and thrill-seeking space tourists. The inflatable design developed by Bigelow Aerospace isbased on discontinued research by NASA under the Transhabproject on modules made with Kevlar-like composites that expand in space. Theseoffer far more room than comparable modules on the International Space Station,while providing as much or more protection against radiation and impacts fromdebris, Bigelow officials said. "When traditional metallic structures in space arestruck by solar flares, they get a secondary radiation effect called scatteringthat can be deadly," Gold explained. "Our structures are nonmetallic,substantially reducing that problem and offering enhanced protection againstradiation." When it comes to impacts from micrometeoroids and the like,the Bigelow modules' skins can not only absorb and disperse the energy fromstrikes, but can retain their shape as well. "Expandable structures holdtheir integrity longer than physical structures, which can collapse," Goldsaid. "The additional volume our structures have buys additional time tofix them as well." The first Bigelow station will consist of four components inlow-Earth orbit. First is the Sundancer module, which has 6,356 cubic feet (180cubic meters) of usable space and can support a crew of three. Next is anode-bus combination that adds docking capability, and then a second Sundancer.Last comes a BA330 module, which provides 11,653 cubic feet (330 cubic meters)of space and can hold up to six crewmembers. "That's a crew capacity of 12, double that of theInternational Space Station," Gold said. The BA330 boasts four large windows coated with a film thatprotects against ultraviolet rays, and contains an environment control and life-supportsystem, including lavatory and hygiene facilities. The station will be poweredby solar arrays and batteries, similar to the International Space Station. The Bigelow station will be geared toward astronautics andcommercial and scientific microgravity research, Gold said, not tourism. "First and foremost, we are not a space hotel," hestressed in an interview. Bigelow Aerospace already has six customers lined up, in theform of memoranda of understanding with space agencies and governmentdepartments in Australia, the Netherlands, Japan, Singapore, Sweden and theUnited Kingdom. The cost for customers to use the station remains uncertain,"as that's largely driven by the issue of transportation there andback," Gold said. "Once we know what transportation vehicle we'll useand where we'll launch from, we'll have a better idea on costs." Their station could launch by 2015 or so, Gold said, usingUnited Launch Alliance's Atlas 5 rocket or SpaceX's Falcon 9 rocket. 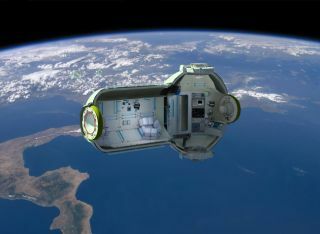 They arepartnered with Boeing to produce a crew capsule as part of NASA's CommercialCrew Development (CCDev) initiative. "Customers and companies that have access to space willbe the economic giants of the future. We hope it happens here, and hope thatall of humanity can enjoy its benefits," Gold said. "The most exciting possibilities include flights fromthe station to the moon or Mars," Sergey Kostenko, chief executive officerof Moscow-based Orbital Technologies, told SPACE.com. Orbital Technologies said the station will have a crew of upto seven and will be serviced by Russian Soyuz and Progress spacecraft andpotentially other commercially available vehicles. The station would consist ofone module about 10 feet (3 meters) in diameter powered by solar arrays, with ausable volume of about 700 cubic feet (20 cubic meters), Kostenko said. Theplan is to launch it in 2015 or 2016. The company added that it already had several customersunder contract from the commercial space industry and the scientific communityinterested in areas such as medical research, protein crystallization, and materialsprocessing, as well as from the geographic imaging and remote-sensing industry.Media projects have also been proposed. "The biggest goal may be tourism," Kostenko said. The CommercialSpace Station could also serve as an emergency refuge for the InternationalSpace Station's crew. "If a required maintenance procedure or a realemergency were to occur, without the return of the ISS crew to Earth, habitantscould use the CSS as a safe haven," said Alexey Krasnov, head of mannedspaceflight at Russia's Federal Space Agency. Orbital Technologies is collaborating with Rocket and SpaceCorporation Energia (RSC Energia) to develop the station. "We are pleased to be the general contractor of thisambitious project," said RSC Energia's president Vitaly Alexandrovich Lopota. "For over a decade, RSC Energia's engineers have outlined and planned forthe production of the CSS. Having 40 years of experience in building orbitingspace platforms, RSC Energia has the technical resources and expertise; and ispoised to build the CSS in a short period of time." Poll: Who Will Win the Private Space Station Race?